Suffering from Painful Gout Flare-up? You wake up in the middle of the night. Your big toe feels like it's being grilled on fire. Ouch! You can barely move, and the EXCRUCIATING PAIN is the worst you've ever felt! Your big toe is red and swollen. You ask: did I break it yesterday? No, you didn't. But... You just had a gout attack! The good news: Gout is treatable, and you can prevent future attacks from reoccurring. Gout is one of the most painful forms of arthritis. 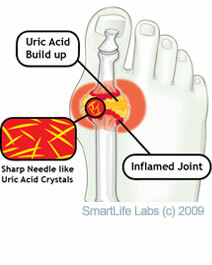 A gout attack can strike without warning with intense pain usually in the joint of the big toe. But, it may also include the ankles, heels, instep, knees, elbows, hips, thumbs, or fingers. To treat an acute gout attack, your doctor may recommend taking anti-inflammatory medications (such as naproxen or ibuprofen) to help relieve pain. Patients with chronic gout can benefit from changes in diet, exercise, and decreased intake of alcohol to help avoid future attacks. Additionally, patients with chronic gout are often prescribed pharmaceutical gout treatment drugs such as allopurinol, colchicine, febuxostat, lesinurad, or probenecid. This relief kit is a set of three natural products beneficial for anyone suffering from symptoms of gout, high uric acid, and painful inflamed joints. † as per homeopathic Materia Medica. 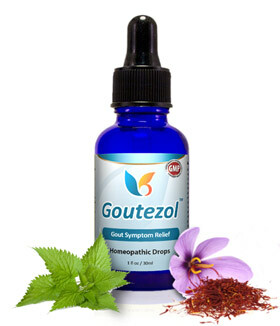 According to homeopathic indications, the ingredients in Goutezol Gout Symptom Relief provide relief for the symptoms of Gout such as: attacks of joint pain, inflammation, stiffness, swelling, and weakness. 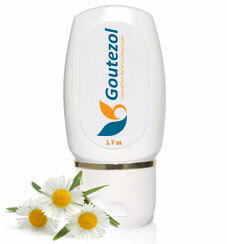 Safe and gentle to use with no known contraindications. U.S. government required disclaimer: There is no scientific evidence that homeopathic products work and product's claims are based only on theories of homeopathy from the 1700s that are not accepted by most modern medical experts. Product safety is our #1 priority. 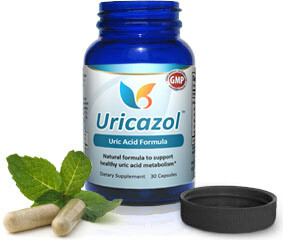 Uricazol contains only natural extracts from herbs and plants that are generally considered safe. 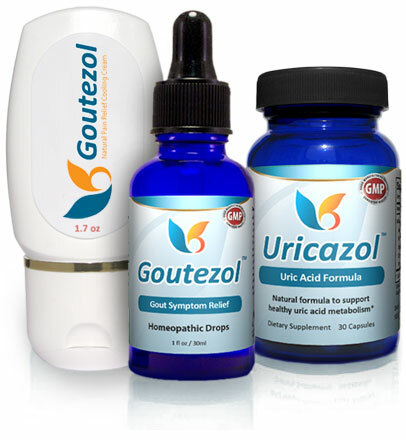 Our customers have been using Uricazol every day since 2009, and so far no adverse events (side effects) have been reported. As is the case with other products you should not use Uricazol products if you are pregnant or nursing because the effects on fetus have not been evaluated. 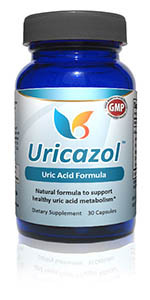 You should not take Uricazol if you have a bleeding disorder or are taking blood thinning medication. 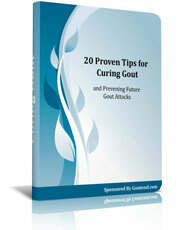 In this eBook, you'll learn 20 key tips to stop gout attacks forever. These tips cover diet, pain reduction, and ways to prevent a gout attack. This no-nonsense eBook is a lesson on simple lifestyle changes. A must-read for those who want to put an end to this painful inconvenience today.